Social media facilitate differing degrees of involvement in political action, helping more people to take small steps as part of a larger movement: the fourth piece in our series on social media and the transformation of society. Credit: http://politikakademi.org. Some rights reserved. Gee Manoharan is a young Tamil man who was faced with deportation to Sri Lanka from Northern Ireland in February of 2013. He had spent a year living in Derry and Belfast, and volunteered for a variety of civil society groups. When he was detained by the Home Office, friends launched a petition on social media to demand his release. Within 48 hours, almost 2,000 people had signed it. So what was the value of those signatures? It was Manoharan's own courage and determination in filing appeal after appeal that ultimately secured his release from detention and the right to remain in Northern Ireland. But in a process where people are placed under massive emotional strain by an asylum system that is disorientating and inhumane, he says that he took great strength and support from social media. “The online campaign really helped me to go through emotionally tough circumstances,” he told me in a recent interview. “All that time, all of those wishes and voices stopped me from giving up and made me feel closer to the people who were outside and trying to lend me a helping hand. This case shows that it is not the spread of information alone that has transformative potential, but the nature of social media itself: the peer to peer sharing and interaction that allows people to feel connected and act accordingly. In a 2010 New Yorker article headlined “Small Change,” the writer Malcolm Gladwell argued that if a movement is to be strong enough to achieve long-term changes in society, it must build strong personal ties between the participants. Drawing on accounts of the Civil Rights movement in the USA, he claimed that high-risk activism - the kind seen in the Greensboro sit-ins of 1960, when African-American students engaged in civil disobedience in protest at segregation - is rarely a result of the "weak ties" that characterize social media relationships. Facebook activism, he concluded, is "a long way from the lunch counters of Greensboro." Gladwell's analysis is shared by many who dismiss social media activism as “clicktivism” - lazy, self-righteous and ineffective. But the debate about online activism is much more nuanced than this. Not everyone involved in the Civil Rights movement engaged in dangerous activities on the level of those students who refused to budge from segregated lunch counters. Some people donated money, while others drove cars to support actions like the Montgomery Bus Boycott - helping to sustain a boycott of public transport for over a year and marking a significant victory against segregation. Some challenged Black disenfranchisement by voting, some spoke to family and friends to raise support, and some made posters and flyers - for the 1968 March on Washington for example. A still larger network of people across the United States became engaged in the Civil Rights struggle, not through direct organising but by turning their hearts and minds against the policies of segregation in their own daily activities. In just this way, social media facilitate differing degrees of involvement in political action. By lowering the barriers to activism, they make it possible for more people to take small steps as part of a larger movement. When expressed through social media in much larger numbers, public opinion has the potential to influence those in power and to give emotional momentum to those like Manoharan who find themselves on the front lines of a struggle. Had social media existed in the 1960s, I think the Civil Rights movement would have used it, just as activists in the Arab Spring used it too. It’s clear that social media didn't topple Hosni Mubarak in Egypt or any other leader in the region - the Egyptian people did. 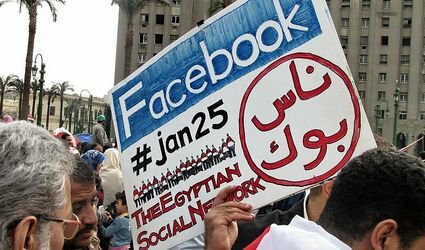 The Arab Spring had more to do with human rights violations, repressive dictatorships, poverty and corruption than it did with social media. But dismissing social media as a mere tool for communication ignores the profound influence that technology can have in shaping politics and culture. The invention of the printing press, for example, didn't just change the speed and reach of information, but the type of information that was spreading. Once book copying was removed from the hands of the church, clerics found it much harder to control and censor what was being written. Culturally, communications technology can change our perceptions of the world and alter our behaviour. If it couldn’t, advertising wouldn’t be the multi-billion dollar industry it is today. Of course, it's not as simple as ‘liking’ and ‘sharing’ to save the world, but social change is always a multi-stepped, long-term process in which social media can play an important part. Although he's always had an interest in the Middle East, Hughes credits social media as the prime motivation for establishing his organization in 2010. Joining Facebook, he explained to me, enabled him to connect with like-minded people, access more information, and gain a deeper insight about the conflict and what kinds of support might be needed. Palestine Aid has funded scholarships in Law and Counseling at the Islamic University of Gaza, and it’s close to raising enough money to install solar panels at the Al-Amal orphanage, also in Gaza - something which should relieve regular shortages of electricity. Hughes has been to Gaza several times to visit projects like these. On one occasion in 2013 he was refused entry and forced to travel to Cairo to make onward travel plans. As he walked through the city searching for accommodation, he found himself in Tahrir Square. There he was approached by a man speaking Arabic and holding a placard with the photograph of another, much younger man. Hughes asked what he could do to help. In my book, that’s not small change.